Air mattresses and ‘air mattresses with frame’ are fundamentally the same thing. The only difference is that with the former, you lay it on the floor or find your own frame or base, and with the latter the frame is provided. Why do people buy air mattresses with frame or without? Why do some prefer to purchase their air mattress and frame separately? Because they are a cheap option? NO!! Air mattress can cost up to and over $500. Then you have the price of the frame to consider. Because they are convenient and easy to set up? NO!! Air mattresses are only convenient if you have no room for another bed in your home. In the first instance, an air mattress is not a cheap alternative to a foam or innerspring mattress. You will find air mattresses selling at prices above those of decent regular mattresses. In the second instance, it would be far more convenient to have a permanent mattress and bed in a spare room if you had one! Here is our top three air mattresses with frames and our top two mattress frames that are suitable for inflatable mattresses. Please note that we have reviewed the Top 10 Air Mattresses previously. Click the link to access that review. You can use any of these air mattresses with the two separate frames we review below. Keep in mind that the latter will involve the extra expense of a frame to rest the mattress on. That said, the first three offers you no choice in the frame your air mattresses will lie on. However, should the frame and mattress fail to work well together you have a legitimate complaint to make which you would not have if you purchased them separately. Buy an Air Mattress With Frame or Use Your Own Frame? The Insta-Bed Raised Air Bed with NeverFlat technology offers a high level of comfort and ease of use. Simply plug in to standard socket, turn the control to ‘Inflate’ and that’s it. 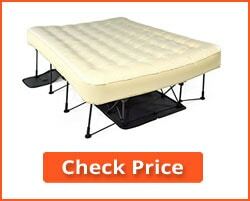 The mattress inflates and forces the base into the correct position. You can choose between three comfort levels: Plush (soft), Medium and Firm. This air mattress comes with two pumps. The first is to inflate the mattress, while the second maintains your desired comfort level through the night. It senses when pressure is lost and silently adds more air to main your setting. Everything is automatic – simply set the dial to your setting, and you can go off and do something else. The mattress has a durable flocked top to provide a soft and comfortable sleeping surface. 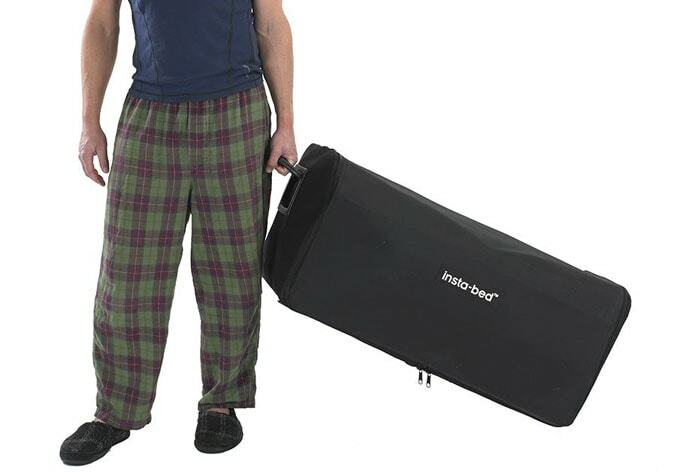 The entire mattress and frame is packed into a compact duffel fitted with wheels for easy transport: dimensions 40”x19”x19”. Two pumps: one for initial inflation and another less powerful to maintain pressure when in use. Simple operation: choose your option then go. The mattress inflates itself and opens up the stand as it does so. Comfortable with three pressure (comfort) settings. Power convertor available on request enabling you to use a car battery to inflate the mattress if you have no mains electricity. Comes with two side tables with cup holders. Most negative comments relate to leaks around the tufted areas and the seams of the mattress. Editor’s Notes: This air mattress with frame appears to be a high quality air bed. It comes with a one-year standard warranty, so give your air mattress a good check over when you are approaching expiry. They are good at responding to warranty requests, but make sure you have been using the mattress according to instructions. Connect the 4D pump to the mattress valve. The double lock valve prevents any leakage while inflating. Once the firmness of mattress suits you, the AirTight system will maintain that pressure. The Coleman Airbed Cot is manufactured with a ComfortStrong air coil system that almost replicates the pocket-coil spring construction of regular mattresses. It offers more comfort and less interruption of your sleep if your partner moves on the mattress. The air coil system reduces the effect of each partner on the other when sleeping. It also tends to provide a more comfortable mattress than air channel mattresses. Not in every case, since quality and price can make a big difference. Total bed height is 22”, making it easy to get in and out of the bed. Some people with floor mattress difficult to get out and stand up, particularly if they have arthritis or any other osteopathic problems. Suitable for people up to 6 feet tall and 600 lb in weight. You can use it when camping or where there is no electrical socket. 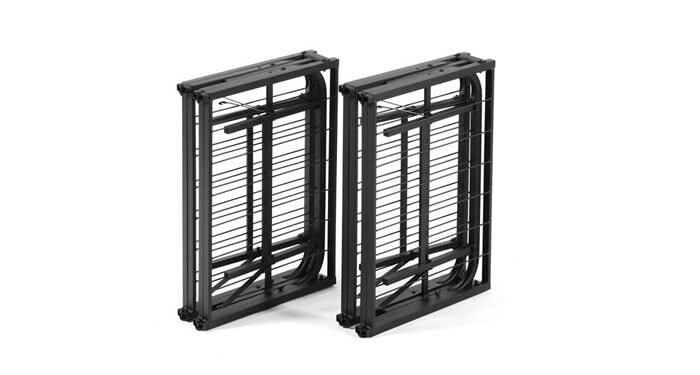 Legs have no locking mechanism as the Coleman frames do. Some have issues with the pump not working properly. Some complaints about loss of air during the night. Once the battery runs dry, you have to find somewhere to charge it. Editor’s Notes: This appears to be an excellent air mattress and frame, although there appear to be some issues with holding air pressure. The pump is powered by batteries which has positives and negative. If you are using the Coleman Airbed Cot, it’s important to top up the battery charge whenever you get the chance. You do not want to find that your battery has run too low to inflate the mattress. The cot itself is OK to sleep on for a night or so, but you wouldn’t want that by choice. We put Coleman’s second because you can use other frames and bases with the air mattress. With the various EZ air mattresses with frame, the mattress is attached to the frame and cannot be replaced. 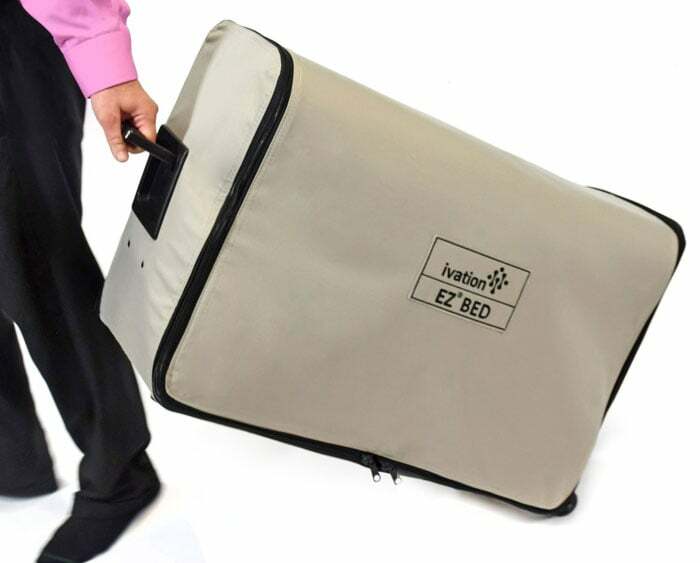 The Ivation EZ-Bed air mattress is easy to inflate. Choose your comfort level on the dial then inflate. The built-in pump inflates the air mattress in under 4 minutes. While inflating, the mattress stand also spreads out. The pump operates until the mattress reaches your desired comfort level (Plush-Medium-Firm). Simply switch to ‘Inflate’ and you can leave the room. When you return your airbed will be ready to use. The mattress consists of 48 circular air cylinders for a comfortable sleeping surface. Because of these individually inflated cylinders, or coils as they are often referred to, the mattress works in the same way as a regular pocketed spring mattress. This is a queen size, suitable for two people. The movement of each person has a minimum impact on your partner. Your movement is less likely to disturb their sleep. Cylindrical ‘coils’ separate the movement of each partner from the other. Flocked top for comfort and to stop sheets moving about on the bed. Fits into a duffle bag with wheels for traveling. As with many air beds, many complaints are about leaks, particularly at seams. Some found it difficult to repack into the carry bag. Unlike our #1 Choice (Insta-Bed EZ) this does not have a secondary pump. You have to switch the main pump on if your mattress deflates. Needs a wall socket for power. There is no battery available for camping. Editor’s Notes: A good mattress with a frame that sets up when you inflate the mattress. You have a choice of three comfort levels, and the flocked top prevents sheets from slipping off while you sleep. Keep an eye on the warranty expiration date, because you will be charged for any issues reported after that date. This mattress is not suitable for camping unless you have a power socket available. The final two reviews will provide our opinion of the top two frames that are suitable for air mattresses. The first three come with the frame. In these cases, the mattress is attached to the frame and you cannot change the mattress for another. The two frames reviewed below can be used with any of the mattresses included in our Best Air Mattress review. You cannot use just any frame with an air mattress. Most ordinary metal-framed foldable bases can puncture inflatable mattresses. You need what is known as a ‘Pragma’ base. Such bases are designed to lie flat with no protrusions that can dig into an air mattress. One of the reasons we are suggesting these is that many people are unaware that metal bases can be used with inflatable mattresses. 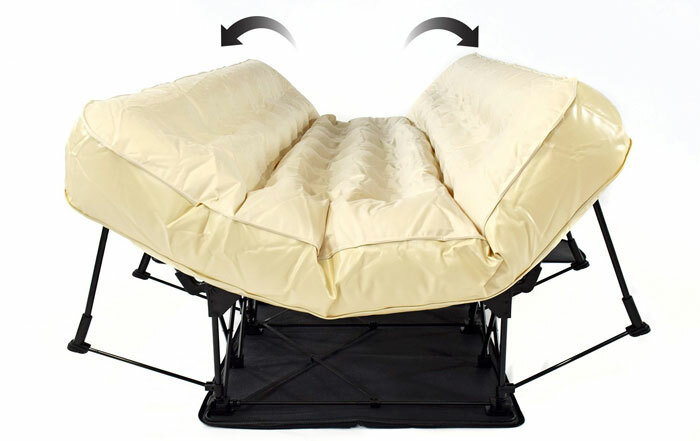 Here are our top two Pragma mattress bases to suit any air mattress of your choice. We have reviewed the Queen size base, although they are also available in Twin, Twin XL, Full, King and California King. Although designed for latex and memory foam mattresses, the PragmaBed simple bifold base is also suitable for air mattresses. In fact, some of the 92% 4-5 star reviews refer to air mattresses. It provides a firm, flat foundation without any sharp points or edges. It is a portable design that unfolds to its full size without the need for additional tools. 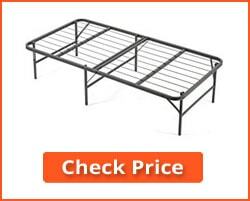 It is available in a range of standard bed sizes including Queen. Recessed wire supports protect the mattress and bedding. It is finished with a hypoallergenic coating that is both dust mite and bedbug resistant. No other topping needed – just place the mattress on top. Heavy duty steel for strength. 13 inches of storage space underneath. No sharps to dig into an air mattress. Easy to transport and setup. Few – most of the few complaints related to weakness in the legs. Some of the 5% 1-2 star reviews comments on weakness in the legs. Editor’s Notes: If you prefer to choose an air mattress from our Air Mattress Review page then this would be an ideal base to use. 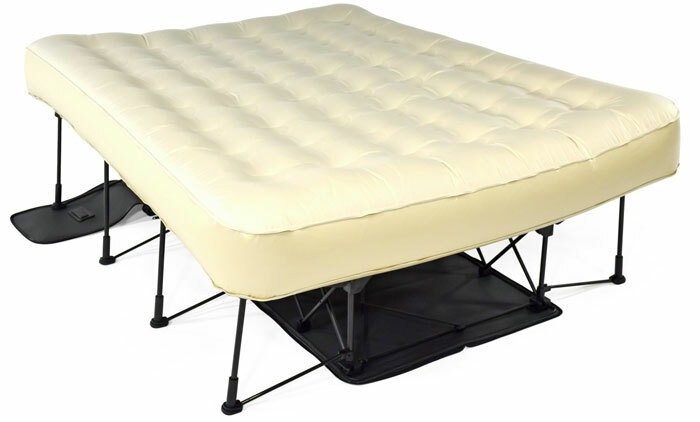 Pragma bases are designed not dig into your air mattress, so they do not cause punctures. This is a strong base, although it does get its quota of negative reviews: though very few of them. If you like the feel of an air mattress, and prefer a brand other than the three above that come with their own base, then this is for you. The PragmaBase quad fold is a base for many types of mattress. It folds four ways. This allows larger bases to be folded into portable dimensions. 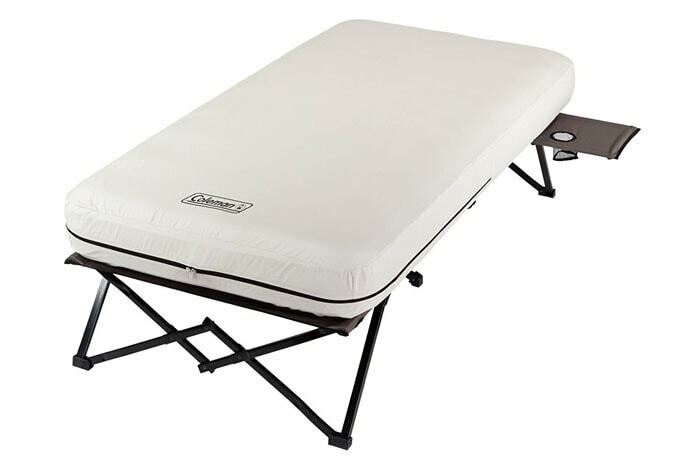 Although eminently suitable for camping, the Pragma Base mattress base can be used anywhere. It can be used in your home or in your garden if the kids want a fun night out sleeping in the garden – with or without a tent! The base keeps the mattress off the ground so there is no chance of the bedding getting wet – unless it rains! Don’t be worried about using an inflatable or air mattress on a metal frame. The Pragma frames are well known for being suitable for use with air mattresses. Most commented on the strength and sturdiness of the support base. It fundamentally does what it says it does! It is suitable for up to Queen-size air mattresses – or any type of mattress. Available in a full range of mattress sizes. Some complained about the struts breaking off and other structural issues. They were no doubt valid complaints, although the vast majority commented positively on its strength, sturdiness and excellent support features. Other than the above – nothing. Editor’s Notes: If you have an air mattress and want to travel with it (camping, etc.) then this is an ideal base for it. It generally has the strength to be folded and reset multiple times, and is the perfect type of mattress base for inflatable mattresses. There have been a few issues reported regarding the cross-struts breaking off, although the vast majority has used the mattress base without any problems. People normally buy air mattresses for their portability, or because they are good for unexpected guests when there is no alternative sleeping accommodation available. Many don’t have a spare room for guests, particularly families where the children snag all the spare bedrooms available. So what’s the option after a party or a poker night that went too long? A cab, yes, but what if they want to stay overnight? Maybe you have your relatives visiting. Where do they sleep? Others buy them because they prefer the feel of an air mattress. The level of hardness of a spring or foam mattress is fixed. An air mattress can be as hard or as soft as you want it to be. That’s why many people prefer an air mattress to any other type. However, one issue that some people have with air mattresses is that they lie on the floor. Many people with inflatable mattresses simply lay them on the floor. That’s OK for younger people, but what about the older generations? They sometimes find it difficult standing up from floor level. So how do you get an air mattress up to normal bed level? Why should those that prefer an air mattress not be able to fit their mattress into a frame in the same way as regular foam or innerspring mattresses? It’s amazing how many people regard an air mattress as a temporary bed, useful for camping or visitors. In fact, there is no reason why such mattresses cannot be used as the principal bed in your home! An air mattress provides good support. The level of support offered by an air mattress is easily adjusted. With any other type of mattress you are stuck with what you buy! Have a back problem? You can adjust the level of support to suit yourself. What other type of mattress can you do that with? 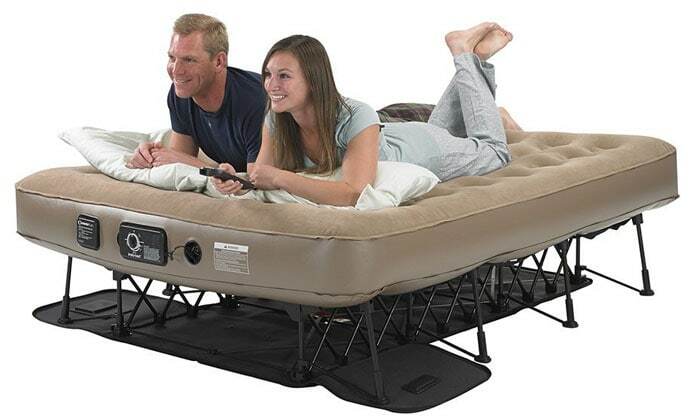 It is possible to purchase what is known as an air mattress with frame. The mattress comes with its own frame attached. The frame spreads out as the mattress is inflated. We have reviewed three of these above. Alternatively, you can buy an air mattress without the frame. 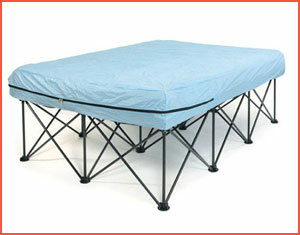 You can place air mattresses on any solid base or on an innerspring base with a flat top. Slatted frames are not recommended for air mattresses, and we have reviewed two of the recommended air bed frames above. 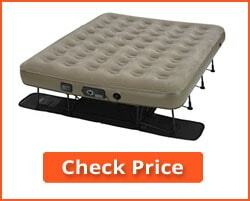 Many find the air mattress with frame gives them a complete solution to sleeping on air. The frame is designed to suit the mattress and the package offers an excellent ready-made air bed to those that prefer simplicity. Others may want to choose their own base. 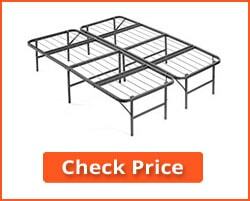 Here are some tips on buying the air mattress frame that suits you best. An air mattress and the frame to go with it is a good form of emergency bedding for unexpected guests. Sleeping on the floor is no fun. Many of us believe that comfort should always be a priority whether you are going camping or have guests coming to spend the night. While air mattresses offer cheaper solutions, getting one with a frame can make the experience even more luxurious. There is not a great deal of choice of inflatable mattresses that come with their own frame attached. The three we have reviewed pretty much cover the range. However, if you are prepared to purchase the frame separately , then you have a wide selection available to choose from. Any frame will do if you place a board of plywood on top. You could also use a box spring as the base for your air mattress. If you want a frame that you can take camping, then make sure it is a Pragma frame or platform. Then you can be sure it will be safe to use with an inflatable air bed. A Pragma frame won’t dig into the bed and puncture it. Anything else may give you problems.